This is an overview for how to assess a solar installation for a residential property and pair the system with an EV or two to generate your own power and drive on sunshine. This is not an attempt to document every scenario, but rather to share the overall direction and flow from which you can, with your newfound knowledge, move forward with an installation of your own. Let’s get started! When we first put solar panels on the roof of our 2-story home here in sunny Southern California, I understood the concept but had some questions about how it all actually worked. It was quite the learning process, and since then, I have continued to add panels to the roof to offset our base usage while also adding more load to our system with the addition of 2 EVs in the last 12 months. With all this, we are now living the dream and effectively “driving on sunshine.” As there were so many learnings with both systems, this article will help frame both pieces of the puzzle in order to help others understand some of the nuances and how they work together. The first step towards getting solar panels up on your roof is sizing the system. This is one of the first steps a solar installer will typically do for your site, but you can also go through it yourself to understand the details or for a DIY installation. Many factors dictate system size but the two big ones are the usage you want to offset with new solar generation and the solar potential of the installation location. Calculating your estimated usage is very straightforward, as your utility has a vested interest in tracking usage accurately so it can bill you for it. 🙂 Look up the last 12 months of bills and capture the monthly usage in kWhs for each month. The resulting total is your starting point for annual usage. Next, take into account any big project that could impact your usage in the next few years — adding an EV (I’ll review estimating EV usage below), removing a hot tub, installing LED lighting, etc., and either add or subtract those from the annual usage total. Finally, determine what % of that usage you would like to offset. Most installers will use 90% of the production, as any excess is typically not a good investment for the homeowner. My personal goal is to continually generate at least 105% of my total usage. 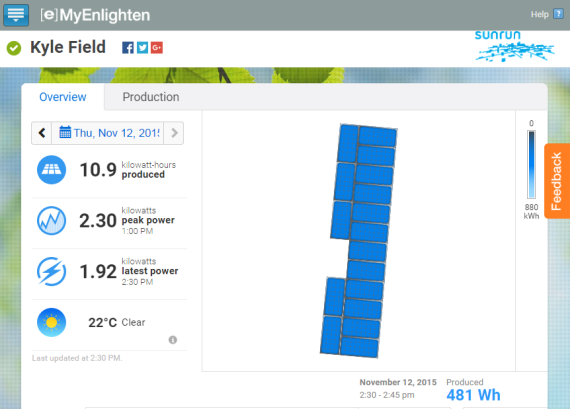 To understand the solar potential of your location, use an online solar production potential calculator like PVWatts. You enter the key details of your system — some which take more work than others, like installation address, system size (from your work in the previous step), tilt, module type, etc., and the system spits out a nice annual chart of estimated production by month, including the value of the energy produced. Buy this system outright with cash. The system is yours and all generation is “free” after the initial purchase. Financing. Finance the system through the installer. These contracts are getting sticky so definitely another one to watch out for. It may be better to finance through an unrelated bank to pay for the system vs finance through an installer. A great article on Solar Love flagged some key details on a new SolarCity financing scheme that seemed less than consumer friendly. Before you lock in and sign papers, dig into the return on investment that the solar salespeople (yes, they are trying to sell you the system, even if it’s a zero-down deal) pitch to you. A few tips — look for price increases in the retail electricity they are comparing to. For instance, in my area, Tier 1 rates were $0.12/kWh when I signed up and they projected 5% increases every year. To validate that, I went in and flattened the price of electricity for a “worst case scenario” payback. Since 2011, however, we did offset the small amount of Tier 2 power we had been paying for ($0.19/kWh) and our Tier 1 pricing has gone up quite a bit and is now $0.15/kWh which is inline with the solar company’s projections. I have also built an Excel sheet (as I’m prone to doing) to track our solar production, home usage, efficiency savings (improvements in total usage vs base), payback, etc. There’s a notable blip in Jul ’13 when we went from 5 to 12 panels, with each calendar year change as we “net out” and either add or subtract the annual bill or credit into the equation and add in any pricing changes in the “SCE $/kWh” column. I dropped a copy into my Dropbox public folder if anyone wants to find all my errors/reapply/make it your own (link). What a whirlwind of data. Now that your head is spinning with numbers, take a break, grab some coffee, and come back in 5. When buying an EV, you enter a new world of numbers and metrics. Nobody will tell you the most important factor in calculating your energy usage, but it’s simple — miles per kwh. Basically, how far you can drive on one unit of electricity. Boiling it down to the basics, your EV has a certain battery size — say 24 kWh — and gets a certain range — like 84 miles. Roll those two together and you get the manufacturer’s estimated miles/kWh rating. In this case, that’s 84/24 or 3.5 mi/kWh for my 2014 Nissan Leaf. I must have a light foot because I have averaged 4.1–4.3 mi/kWh since we’ve had it… which also means I get more miles out of a charge, which is nice. Now that we know how efficient your EV (or EV-to-be) is, just roll that into the number of miles you drive per year or plan to drive in the years ahead to get your EV’s annual kWh usage. You can run this through the same usage-to-system-size calculation to determine what size PV system you need to power your car. In my case, I used the actual production averages from my panels to calculate this at a “high” miles per year number (12,000) and a “low” miles per year number (8,000) to understand what those thresholds looked like, then sized accordingly. Or… in simple terms, the amount of money we would have spent on gas minus the money we would have spent on electricity = savings from the EV vs a gasmobile.